The California Senate Bill 151 and the Medicare / Medicaid Section 7002(b) of the US Troop Readiness, Veterans' Care, Katrina Recovery, and Iraq Accountability Appropriations Act of 2007, requires that Level II-Level V prescriptions be written on forms that are compliant. Don't risk having your customers' prescriptions rejected by the pharmacy! We can make sure your practitioners' documents meet these requirements. produced by a Secure Vendor. 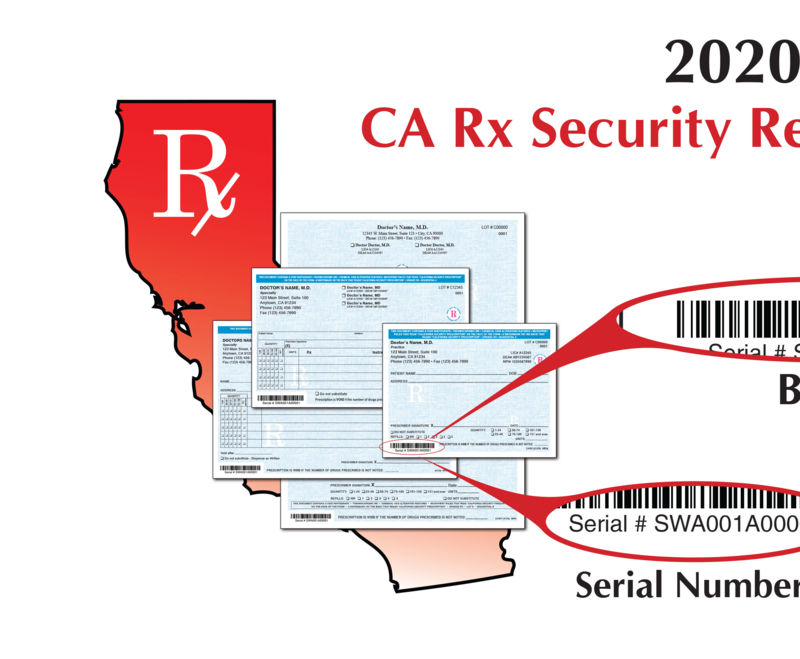 Effective 1/1/19 the California Department of Justice requires that all California controlled substance prescriptions include a serial number that is unique to each individual prescription printed in order to heighten security. Sterling Business Forms strives to be current on all ongoing changes to state regulated prescription pad requirements to keep your customers in compliance. 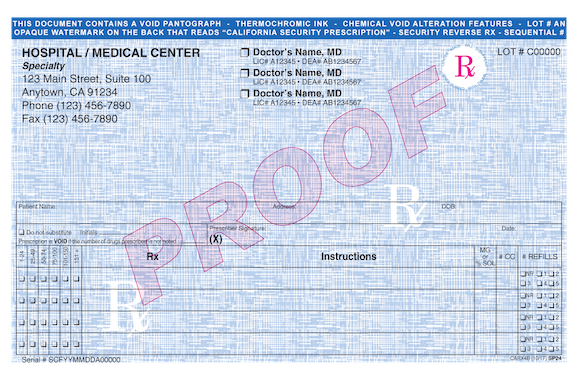 Prescription Pads produced before this time-frame are NO LONGER COMPLIANT. 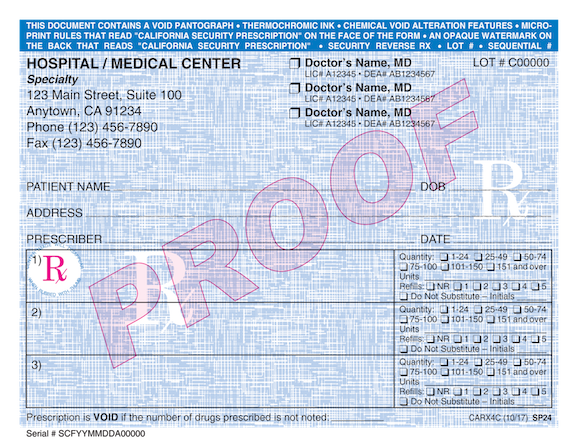 Thus, as of January 1, 2019: (1) Each controlled substance security prescription form used for prescribing on or after that date must include a unique serialized number in an approved format (Health & Safety Code, § 11162.1, subdivision (a)(15)); and (2) No person shall prescribe a controlled substance on or after that date, nor fill, compound, or dispense a prescription for a controlled substance written on or after that date, without this security feature (Health & Safety Code, § 11164, subdivision (a)). 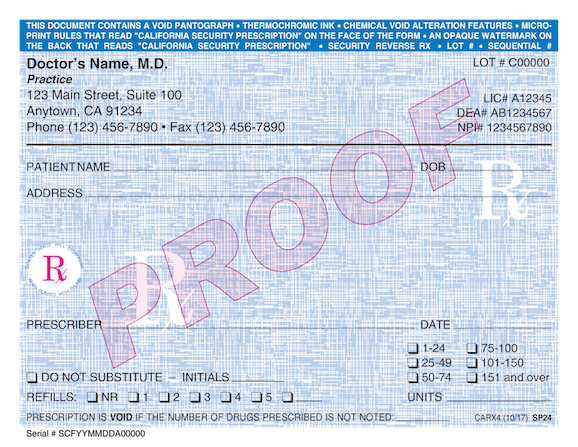 Serial numbers must include a 3 digit alpha code (SCF) provided by the Department of Justice, followed by the production date (YYMMDD), followed by sequential numbering based on the number of prescriptions running for that day, beginning with A00001 for each specific day. Note: This new security feature will be added to existing prescription forms and will not replace any other security features or numbering currently used. Download the PDF HERE or visit https://www.pharmacy.ca.gov for more info. Sterling Business Forms Prescription Pad Distributor! 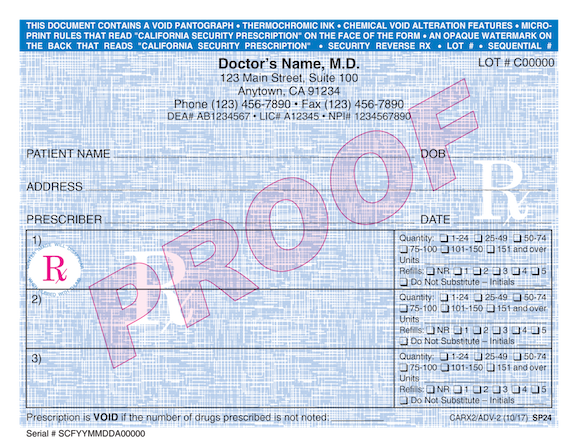 Click here for a complete listing of approved Prescription Pad Distributors. Finished product may differ in appearance.